Colorful! NOTE: The green American 2 is available for purchase here. German-based Faber-Castell, established in 1761 by the cabinet maker Kaspar Faber (1730-1784), is one of the oldest industrial companies in the world. 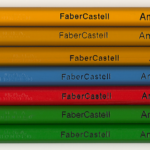 Faber-Castell USA, part of the Faber-Castell family of companies, is based in Cleveland, Ohio.